Discussion in 'Classic Menswear' started by DocHolliday, Jun 27, 2008. I'll get things started with a stock photo. I'll try to add more later, but don't hesitate to post your own. I know there's some great stuff out there. Immediately a rooster crowed a second time. And Peter remembered how Coho had made the remark to him, "Before a rooster crows twice, you will deny me three times." And he began to weep. Doc, thanks for the thread and for posting the pic. Details of each would be great. I'm particularly interested in seeing a close up pic and getting details of the one with the sterling handle. I'll try to post mine tomorrow. What do you guys think about a straight handle? Looks less dandy and more business, like... should the opportunity presents itself. I'm not fond of the ones I've seen. Do you have a pic of a particular one? They make great umbrellas for the price. Hey, I like to cast my net as wide as possible. 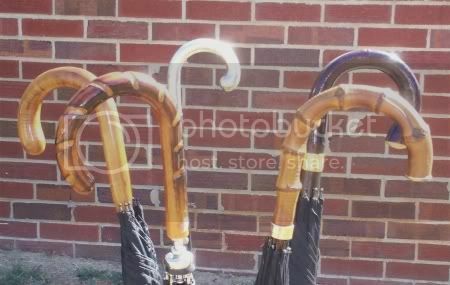 Clockwise from left: American-made "Peerless" stick-through; antique sterling-handled umbrella with unusual black shaft, possibly bakelite; Brigg chestnut bark stick-through; Fox whangee; and an unknown maker, probably from the '60s, with automatic opening mechanism. That last one is nothing special, but I really like it. I think the colors on the carved handle are very attractive. I like the crook because you can hang it over your arm to free up your hands. Coho, I looked at the site but didn't notice any straight handle umbrellas. They do have good prices. Doc, how often do you actually use your sterling handled umbrella? I have one but haven't found an occasion to use it. I think they're basically Briggs in workmanship without the royal warrants and brand name markup--which I like. Both companies have a great history and make great umbrellas and fox is just less well-known. I remembered seeing them in the ladies section as I was checking out the site. I'll try to see how flexible they are with building semi bespoke umbrella. For the price, I won't mind paying a little more to get everything right. Essentially never. Not only does it have the sterling handle, it's very much in a vintage style. I bought it more as an unusual collectible than for regular use. T&A on Jermyn St sells Fox umbrellas. The Fox umbrella makers are not or were not the same Fox who makes the Fox frames used in good umbrellas. The Henry Poole website seemed to have decent prices on Brigg umbrellas. La langue morte t'emmerde . No, they look like you're going to go caddying for someone on a golf course. The Church (shoe store) also sell Fox, at lease in their HK store. If one has antiqued the strap-ons to match the EGs, this provides license to share them. Modeling them is entirely the poster's prerogative. 1. Focusing on building existing and acquiring new relationships, not things. 2. Engaging in activities that are meaningful, fun, and rewarding. 3. Giving of your service, time, and even resources to others. 4. Forgiving others and not holding grudges. 5. Having a sense of humor in that you laugh often and don't take yourself too seriously.